With the Ringling Brothers Red Unit Circus train scheduled to make the 100 mile trip from Philadelphia, PA to Brooklyn, NY on Tuesday I was ready to photograph it as it made its way east over CSX's Trenton Line. Unfortunately this train once again proved to be elusive to me. No postings on the various websites that monitor rail activities did not afford any information as to the train's where abouts. 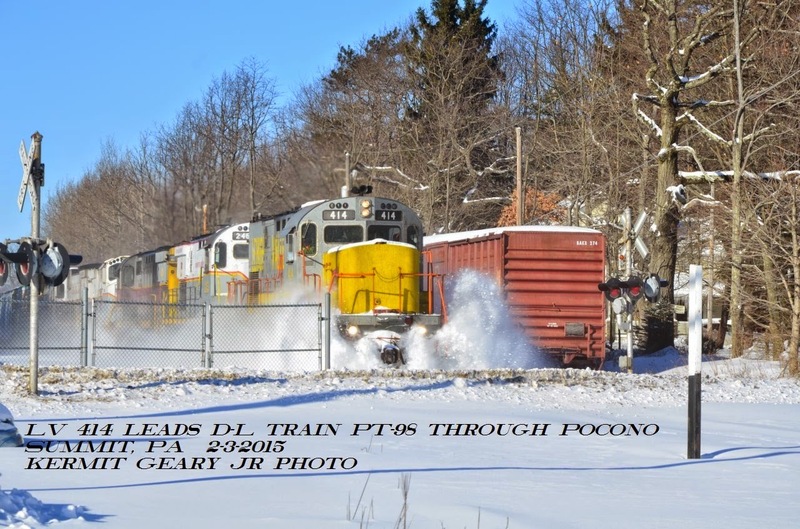 As a alternate plan I decided to wait for NS 20E which had the Lackawanna heritage unit trailing behind 20E's leader. After all I couldn't afford to let Tuesday's good sunlight go to waste now. 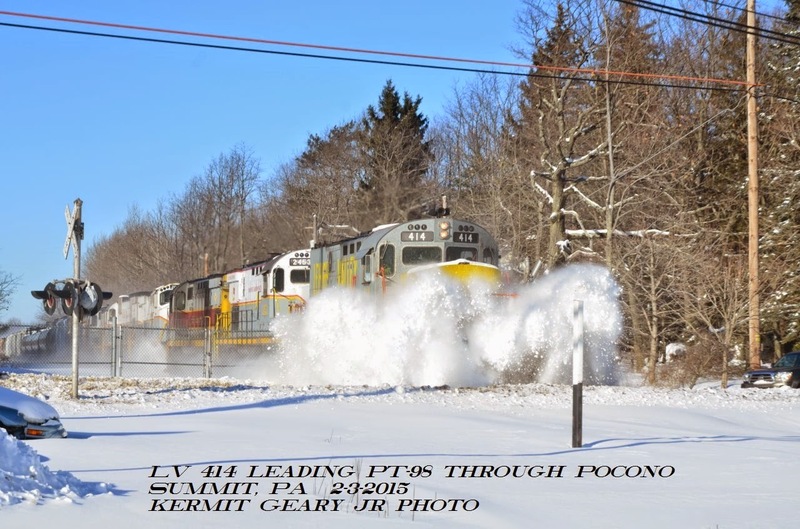 It is seen here passing a malfunctioning Valley Road grade crossing (LEHL MP 40) in Hillsborough, NJ around 12:30. 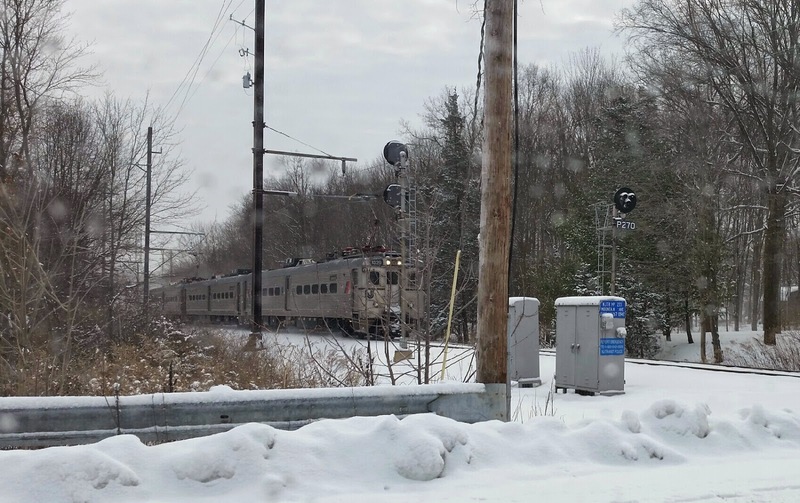 Following photo is of a NJT train approaching a grade crossing in Gillette, NJ the morning of 2-18-15. Sent to us via email from Deborah Schleiff. Our thanks to Deborah. I am writing to you today with two primary messages. The first is to direct you to our website where we have posted our February service update which outlines current resource planning, maintenance of way work plans, service metrics, an overview of our 2015 Capital Budget, and our expected return to steady state network performance early in the second half of the year. As previously advised, these updates will continue on a monthly basis as the year progresses. The second message is to thank you for your friendship and support over my 39 year career with Norfolk Southern. At the end of this month I have decided to retire and transition to a slightly slower pace, unless of course, I decide a faster pace is more desirable. It has been a distinct pleasure and privilege to work with many of you personally over this long period of time. I extend my very best wishes to each of you for your continued success and good health and as always, thank you for your continuing business with our fine company. ...was cold feet and a roster shot of the Central of Georgia! I had seen various postings on the Internet and thought I'll get this heritage unit in Sunday's good sunlight. I was going to wait at the LEHL's CP SULLY (MP 40) in Hillsborough (NJ) for the 66Z but switched over to Manville's 13th Street grade crossing. The morning wind was icy cold and brutal so moving over to Manville's 13th Street grade crossing seemed like a good idea at the time. When the 66Z's headlight was seen, I could exit the sheltered warmth of my truck to get the image. That 'ol saying "...the best made plans of mice and men go astray" was appropriate as my plans were destined to go astray. 66Z took the Royce Runner (Main 1) around 10:15 and held until permission was given to head east around 3:30. It was my understanding that a truck had struck a bridge causing various delays to operations within that area until a bridge inspector could come out and check for possible structural damage. For me the best image of this day was not of 66Z's heritage unit but of NS 290 heading east through the swirling snow. From the vantage point were this photo was taken, one can usually see pretty far west. Not so in this scene since the snow kicked up by 290 and winds have drastically reduced the visibility. started out early on Saturday morning with a call from my wife who was out shopping. Passing beneath the LEHL in Hillsborough (NJ) and called to inform me that there was "...an tank car train stopped on the siding." Before hanging up she said "Happy Valentine's Day!" With that conversation ended I was out the door and heading towards Manville's 13th Street grade crossing (LEHL MP 37). Sure enough it was holding on the Royce Runner (Main 1) for NS 20E to pass. At 9:36 20E passed by with NS 9560, NS 7707 and NS 2607 as the power consist. Shortly there after, 66Z made its way down the siding. I was hoping that this 66Z would be the one with the Central of Georgia leading but that was not to be. Saturday 66Z's power would be NS 3417, UP 5624 and UP 7024. Perhaps Sunday will be the day the C of G heritage unit passes through. Hoping to catch NS 212 with the KCS leading, it was then off to Stanton Station for the cold wait. At 12:13 212 came through with KCS 4104 leading. Prior to 212's arrival, NS 211 would take the siding at CP 53 and hold for two more east bounders after 212. Lead by NS 9655 and NS 9086, the next east bounder to pass by was 22V @ 12:30. NS 20R was the final east bound intermodal having NS 1098 and NS 9924 as its power consist. Once 20R had cleared, 211 headed west , led by NS 7587 and NS 7655 @ 1PM. With 211's passage and the forecasted snow starting to fall, it was time to head home and thaw out! 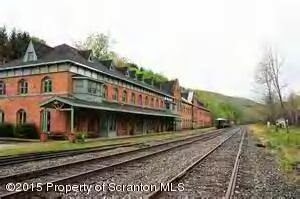 The 1863 Erie Railroad depot and hotel known as The Starrucca House located in Susquehanna, PA are for sale. Susquehanna, PA is north of Scranton, near the NY border; south and east of Binghamton, NY. Photo from Oaklands Real Estate web site. The Erie Railroad Station in Susquehanna, Pennsylvania was built by the Erie Railway (later reorganized as the Erie Railroad) in 1863. The three-story Gothic Revival structure included a large hotel, called Starrucca House, with rooms for 200 people and a 120 feet long dining room. Overall building size is 327 feet (100 m) length by 40 feet (12 m) width. The railroad converted the hotel into offices and sleeping quarters for railroad personnel c. 1903. Alterations were made to the building in 1913 and 1917. The Erie Railroad merged into the Erie Lackawanna Railroad in 1960, which ended passenger train service over the former Erie Delaware Division through Susquehanna in 1966. All remaining passenger service on the former Lackawanna route via Scranton, PA, was discontinued on January 6, 1970. The station was listed on the National Register of Historic Places in 1972. Once in a lifetime opportunity to own one of the most unique properties in Pennsylvania. The Susquehanna Rail Depot aka the Starrucca House, built in 1863 by James P. Kirkwood for the Erie Rail Road, it was the epicenter for entertaining. This property is ripe for development, featuring 13,040 sq.ft. of space as well as railway accesses the property has endless opportunities. The real estate web site also has about 100 current photos of this property, mostly of the interior. Note: This Solari board is a split-flap display used to show train arrivals and departures. It is named after the manufacturer, Solari di Udine from Udine, Italy. 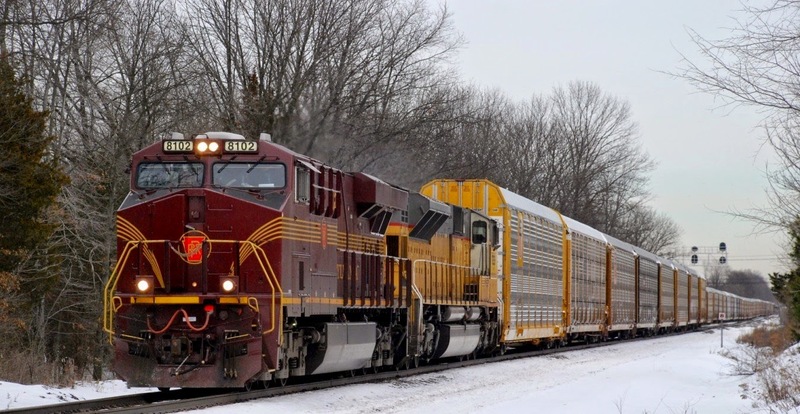 Norfolk Southern operations in the Midwest, Ohio Valley, Northeast and Mid-Atlantic areas are expected to be impacted over the next several days by heavy snow, blizzard conditions and sub-zero temperatures in association with Winter Storm Octavia. Customers should expect delays of 24-48 hours on traffic moving through these areas. NS 212's colorful trio of motive power! NS 212, an Atlanta, GA to Croxton, NJ intermodal, with a trio of KCS diesels (4568, 4609 and 3932) is headed east on the Lehigh Line MP 40 @ 10:37 as it approaches the Valley Road grade crossing in Hillsborough (NJ). JACKSONVILLE, Fla. - February 11, 2015 - Fredrik Eliasson, CSX Corporation (NYSE: CSX) executive vice president and chief financial officer, will address the Barclays Industrial Select Conference in Miami, Florida on Wednesday, February 18, at 8:05 a.m. Eastern Time. NORFOLK, Va., Feb. 6, 2015 – Norfolk Southern Corporation (NYSE: NSC) Executive Vice President Finance and Chief Financial Officer Marta R. Stewart will make a presentation during the 2015 Barclays Industrial Select Conference. Where: Loews Miami Beach Hotel, Miami, Fla. 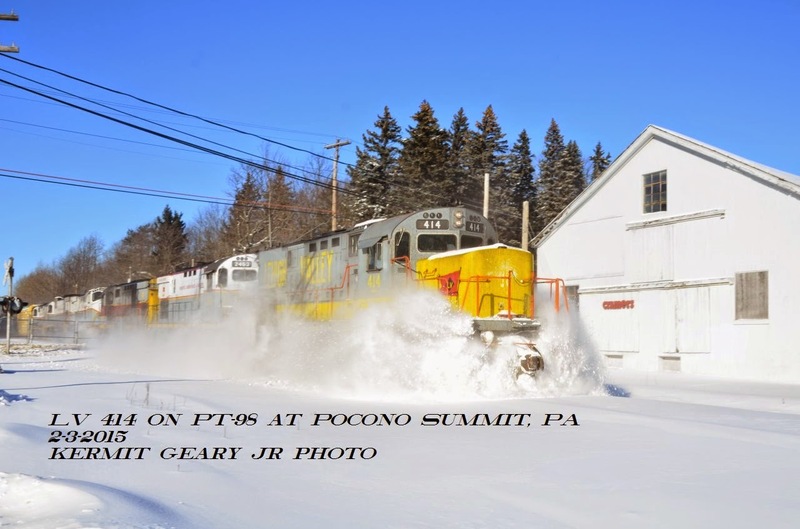 Received the following from The Delaware River Railroad Excursions in Phillipsburg, NJ. 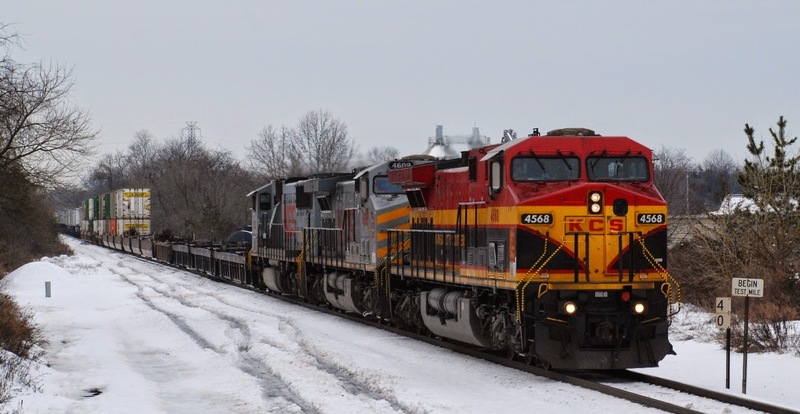 CSX is preparing for possible impacts to its Canadian operations as a result of unresolved negotiations between the CP and CN railroads and the TCRC (Teamsters) and Unifor unions, which represent several transportation and mechanical operating crafts. CP Canadian rail workers could go on strike if a deal is not reached by 12:01 a.m. on February 15, 2015. A strike could result in halted or delayed shipments to and from Canada. CSX expects traffic would be most impacted in Buffalo and Detroit, where CSX interchanges with CP. At this point, normal CN operations are expected to continue. CSX is intensely focused on continuing to serve customers' needs and is closely monitoring the situation while preparing contingency plans that would be activated in the event of a strike. A broken rail in Three Bridges (NJ) at LEHL MP 48 would disrupt Thursday morning's traffic along NS's Lehigh Line. 11J would hold what was once referred to as the Royce Runner, now designated as Main 1, at 10 o'clock to wait for three eastbound trains. Two intermodals and a 66Z would pass before the 11J was finally allowed to proceed west on Main 2 at 12:27. 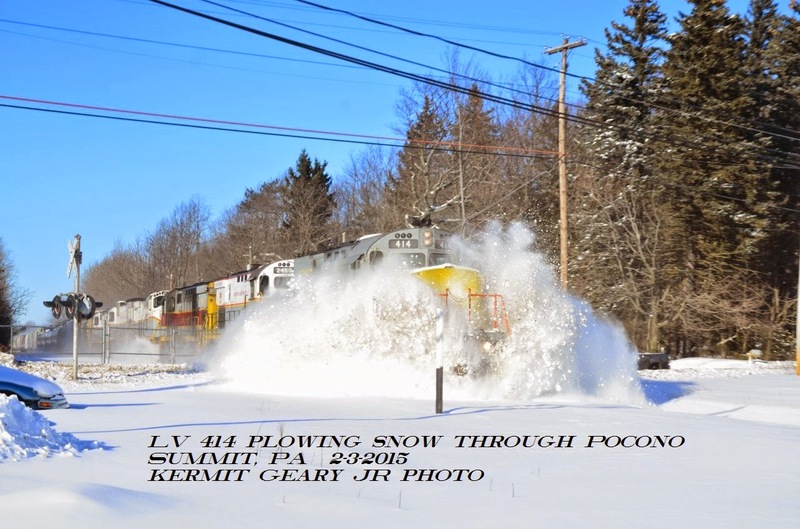 It is seen here at CP SULLY near the Roycefield Road grade crossing in Hillsborough (NJ). Motive power was NS heritage unit PRR 8102 and NS 7239, ex-UP 8009 SD90MAC. NS 11J is a Doremus (NJ) to Detroit (MI) daily train that consists of empty autoracks. After my two and one-half hour wait and 11J passage, it would be time to head to the nearest deli for some hot coffee in order to warm up. 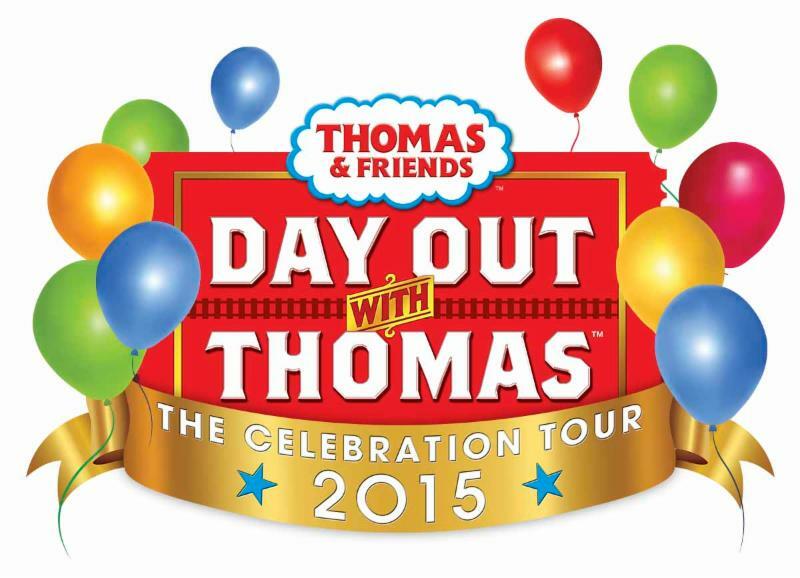 Don't miss your chance to meet Peter Cottontail aboard the Black River & Western Railroad! 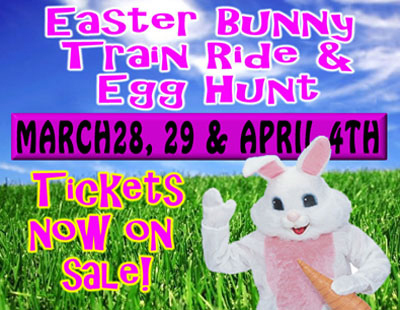 The Easter Bunny Express operates Sunday March 22, Saturday - Sunday March 28-29, and Friday - Saturday April 3-4. Trains depart Flemington Station only. Visit our website for the complete schedule of departures. Reservations are required, and are now available through our website! 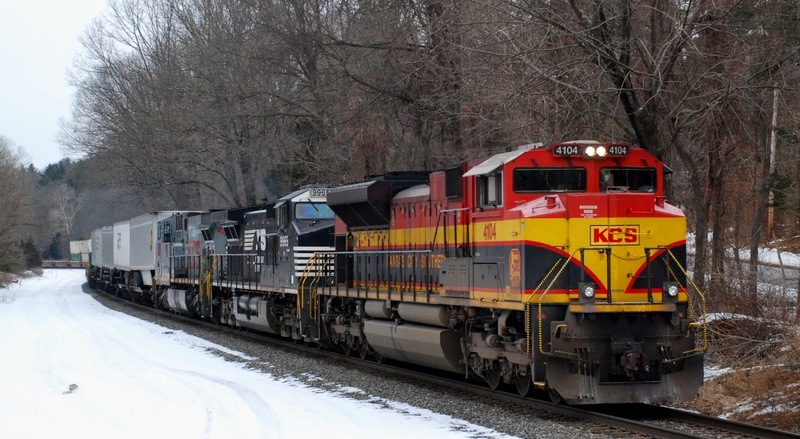 NORFOLK, VA., Jan. 30, 2015 -- Norfolk Southern and the Brotherhood of Locomotive Engineers and Trainmen today reached a new collective bargaining agreement that continues to link engineer compensation to corporate performance through 2019. The agreement, which covers approximately 4,600 locomotive engineers, provides engineers with an annual bonus opportunity based on corporate performance and for the first time includes individual incentive opportunities based on personal performance. The agreement also includes changes to improve engineer work scheduling, which will help ensure that NS has a more stable and available workforce while providing employees with more predictable schedules. NORFOLK, Va., January 26, 2015 – Norfolk Southern Corporation (NYSE: NSC) today reported financial results for fourth-quarter and full-year 2014. Net income for the quarter was $511 million, or $1.64 per diluted share, compared with $513 million, or $1.64 per diluted share, earned in fourth-quarter 2013. For the year, net income increased to a record $2.0 billion, 5 percent higher compared with $1.9 billion for 2013. Diluted earnings per share for 2014 were a record $6.39, up 6 percent compared with $6.04 per diluted share for 2013. § Railway operating revenues totaled $2.9 billion. § Income from railway operations was $891 million. § Net income totaled $511 million. § Diluted earnings per share were $1.64. § The railway operating ratio was 69.0 percent. § Railway operating revenues reached $11.6 billion. § Income from railway operations was $3.6 billion. § Net income totaled $2.0 billion. § Diluted earnings per share were $6.39. § The railway operating ratio was 69.2 percent. <· Operating revenues were $2.9 billion, about even compared with fourth-quarter 2013, with gains in merchandise and intermodal revenues offsetting weaker coal revenues. Total volume was up 4 percent, or about 66,000 units, due to gains in intermodal and merchandise traffic. <· Intermodal revenues increased to $649 million, 5 percent higher compared with fourth-quarter 2013. Growth in international and domestic business pushed traffic volume up 6 percent in the quarter compared with the same period of 2013. <· Coal revenues were $543 million, 15 percent lower compared with the fourth quarter of 2013. A weak global export market and fewer shipments of coal to utilities combined to decrease volume by 6 percent. <· Railway operating expenses were $2.0 billion, down 1 percent compared with the same period of 2013. <· Income from railway operations was $891 million, a fourth-quarter record and 1 percent higher compared with fourth-quarter 2013. <· The operating ratio, or operating expenses as a percentage of revenue, improved 1 percent to 69.0 percent, compared with the same quarter in 2013. <· Railway operating revenues reached a record $11.6 billion, 3 percent higher compared with 2013, driven by a 5 percent increase in traffic volume. <· General merchandise revenues rose 6 percent to $6.7 billion, and traffic volume increased 5 percent compared with the prior year. 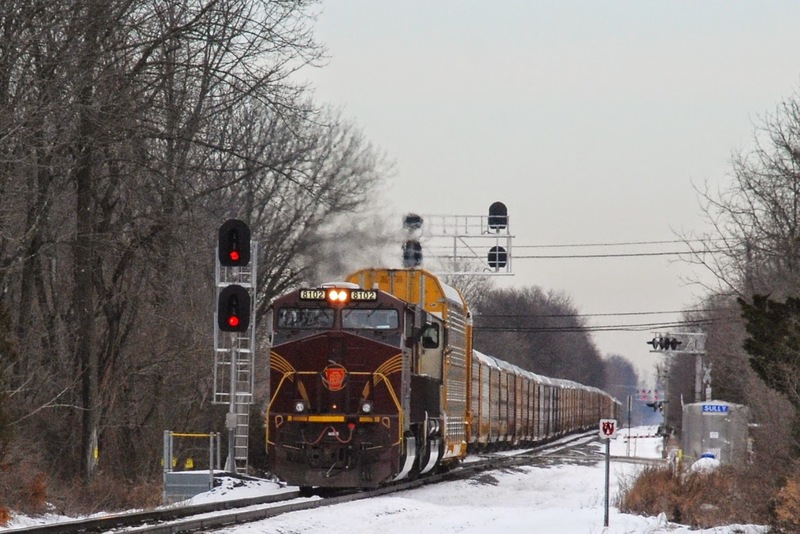 <· Intermodal revenues increased to $2.6 billion, up 7 percent compared with 2013. Traffic volume was 8 percent higher for 2014 compared with 2013. <· Coal revenues were $2.4 billion, down 6 percent, due to a 5 percent decline in traffic volume compared with 2013. <· Railway operating expenses were $8 billion, up 1 percent compared with 2013. <· Income from railway operations was a record $3.6 billion, 10 percent higher compared with 2013. <· The operating ratio for the year was a record 69.2 percent, a 3 percent improvement compared with 71.0 percent in 2013. 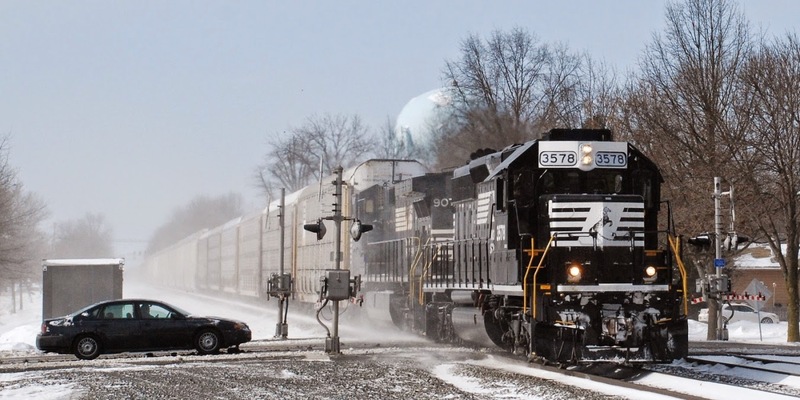 ROANOKE, Va., January 27, 2015 – Norfolk Southern today announced that it will close its Roanoke office building at 110 Franklin Road SE later this year and relocate the functions currently housed there to Atlanta or Norfolk. Approximately 500 people currently work in the building in marketing, accounting, information technology, and other departments. Affected employees will have the option of relocating with their positions. The action is being taken to foster departmental synergies and to make better use of the company’s real estate assets and support the company’s goal of streamlining its management workforce. 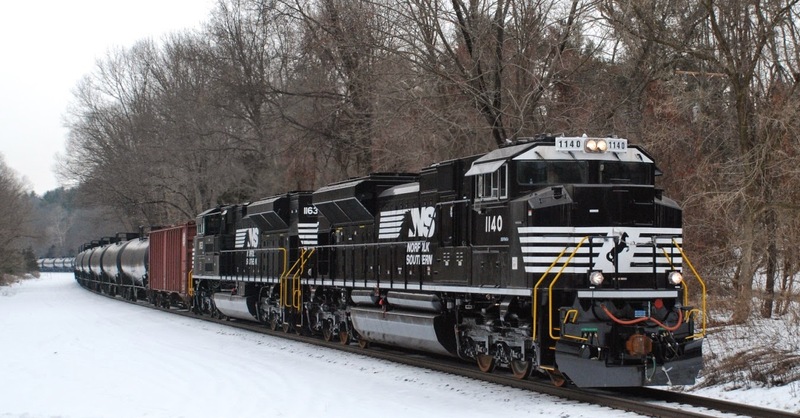 Norfolk Southern is in the final process of evaluating which positions will be relocated to its corporate headquarters in Norfolk, Va., or its operational headquarters in Atlanta, Ga. Some regionally oriented positions will remain in Roanoke but will move to other work locations in the area. 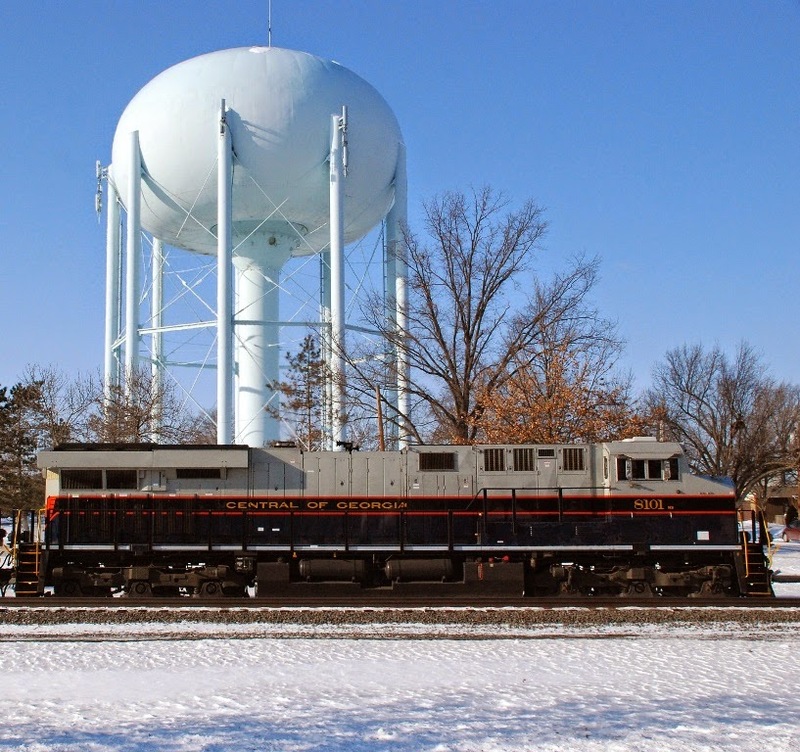 Roanoke will remain the headquarters for Norfolk Southern’s Virginia Division, and the company will continue operating a local switching yard and locomotive and car maintenance facilities at Shaffer’s Crossing, and a locomotive overhaul and rebuilding facility in its East End Shops. 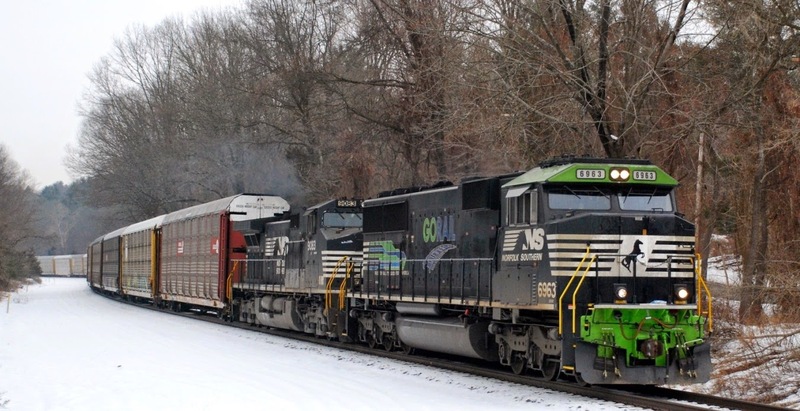 In total, about 1,700 people currently work for Norfolk Southern in Roanoke. The Roanoke office building was built in 1992 and consists of more than 203,000 square feet of office space. Disposition of the building will be determined at a later time.